"Working with Marlene has been great! I felt an immediate connection to her during our first meeting like we were old friends just having a chat. After just a few questions she went to work and came back with a clear vision for my brand. So clear that when she was describing my audience it was like she was describing me! Not only that but she gave me extra advice on social media and other aspects of my business as well as encouragement to follow my dreams! I'm so happy with the results, I seriously believe this is the best thing I've done for my business so far! I am so excited to share one of the first Brand Strategy projects that The Mintminds were hired for. You will get useful insights about the process I follow when it comes to the stuff that makes my heart beat faster - aka Research and Brand Strategy - and hopefully it will motivate you to think about your Brand Identity, be it because you don’t have a clear Image yet or because it needs a redefinition. Danelle, a wonderful graphic designer and the founder of Sword & Sparrow supports people that are crafters in their heart and with their hands. When Danelle came to me, I could see that somewhere in between the chaos of all these amazing ideas and thoughts she had a very clear vision in her head. You could say it was on the tip of her tongue but she simply couldn’t manage to find the proper words. So what exactly did she ask me to do? Define a clear Brand Identity and based on that write a tagline for her brand. Step 1: Let’s make a brief! The first step I ALWAYS do with new clients is the Briefing. A Briefing is basically a meeting where I get to ask my client a bunch of questions. He or in this case she answers and I write EVERYTHING down. The end result of this process is the Client Brief: the corrected and cleaned version of all that has been said. This document is the base for all of the next steps which is why, once it is done, I send it to my client in order to make sure that we are on the same page. Once the client says „yup this is exactly what I said and need“ I can start with the next step: the research. I know, I know especially when it comes to your own brand the excitement and joy of finally writing the Brand Identity down is incredibly high. Most of the times that high that we want to start right away and skip the - in my opinion - most important step in order to create a GOOD Brand Image that is not only based on intuition: The research. Based on the Brief and thus based on what Danelle wanted I recommended running a Trend and a Target Group research. Danelle already had a very clear idea of her ideal customer. She wanted to work for people that are - like she is - passionate about what they do. More specific she wanted to put the focus on artisans, craftsmen and creative people. In one of our first Skype calls she told me that she was actually not sure if there was even a market like that. In order to find an answer to that question I did a Trend Research - the brief result: there definitely is a market. The main and first tool I use for my research is quite easy to remember: it's google. I basically searched for anything that is related to the keyword "handcraft trend". Normally the first results will be articles and researches published by institutions that are known in that certain area. The second step I do is to search for the named keywords on the websites of common research centers such as accenture or Goldman and Sachs. So the first and most important outcome of a trend research is the so called "cultural truth", the main trend regarding the analyzed market. For this project the cultural truth showed that there is indeed a trend if not to say a movement going on. One representing quote for this statement was made by Judy Hong from Goldman and Sachs. Especially the sector of crafts beer and other spirits, handmade soaps and farm-to-table-restaurants are booming sectors. The reasons for this trend are amongst others the growing wish to feel unique, to own things that are distinct to mass production and that help the individual to express its unique self. Another way of explaining this movement is that people are craving authenticity and the feeling of being connected to something real instead of something that only exists in a virtual room. Handmade objects are imbued with touch and feel incredibly reel. Also the increasing desire for quality in contrast to quantity gives the crafts revolution more power. There is an increased awareness for the provenance of products. Consumers want a relationship with a product and the makers behind it. To know, where a product has been produced, how and with what materials is highly important. For any craftsman this means, that they have to make everything around their product transparent AND personal. Give information about materials / ingredients, tell about the tradition that stands behind it or your personal background story. Ethical consumption is on arise which highlights again the importance of transparency. Story-telling and content marketing are THE marketing tools nowadays, not only for crafters and makers. This conclusion goes very much in line with everything that has been said before: create and tell a personal story, share your knowledge and skills, be authentic, transparent and approachable. People don't buy products, they buy the emotions and the experience they will get while interacting with the product which is why experiential shopping becomes more and more important. After the trend research I focused more on the target group itself. I wanted to find out, what the handcrafters' deepest inner wish is, what they are struggling with and how they talk, what their habits are basically I wanted to find out everything I could within the time frame I had for this research. The normal research tool one would use here is to run a survey with the target group. Within the scope of this project nevertheless this was not possible. Which is why I decided to go with good old google and the search engine did not disappoint me - at all. 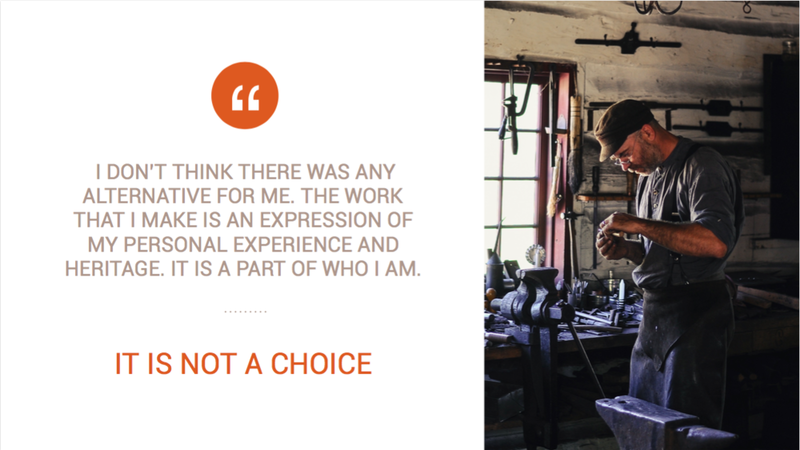 I came across a lot of different blogs that published interviews with craftsmen and -women of different areas. Highly interesting and extremely useful was that the interviews were actually transcribed so I could read and see the exact words that Danelles target group uses. The outcome was a list of characteristics (see in the photo gallery), a list of things that they are struggling with and thus potential content ideas Danelle could write about in her Blog (such things were for an instance how and where to find inspiration and how to come over creative blocks, how to scale a business that seems to be pretty unscalable, how to - as a highly passionate and work loving kind of person - find a proper life-work balance and so on) and last but definitely not least: The consumer insight. A consumer insight is the deepest inner wish of a target group written out of their point of view. You can see the one that I found for Danelles target group in the picture here. The most important aspect of this insight is that the craftsman wants to sell his product not only to make people happy with it but also because he wants to keep on doing what he really loves. And truth be told, most of the makers are not lacking talent but the skills to market themselves. This is their biggest pain point which is ideal for Danelle because this is exactly what she can help them with. After having done the final touches for the target group definition including a moodboard, having defined the cultural truth and the consumer insight, it was time to find out what is the USP of Danelle, what is it that she does best related to the target group and the trends. Based on the way she talks about her work and what her main focus is I found out that her work as a designer is not only aiming for a unique style, look and a beautiful design but focuses on what a crafter's heart really desires: success and thus fulfillment. Danelle always strives for a combination of design AND conversion. Communicated well, this USP will make her highly attractive to her target group. Cool so now the foundation for a good brand strategy has been laid it was time for the highlight: the Brand Image. A Brand Image includes the vision of a brand (the WHY), the mission (the HOW) and the offer (the WHAT). The why is the core of everyone's brand and is for me a deduction of the cultural truth, the consumer insight and the brand's best. I love writing this statement because I always aim to make this a very creative one, a statement that provokes pictures in my clients head that makes him or her see clearly what his brand will look like in the future. After having defined the vision, the mission and offer follow as a result of the vision. For the tagline I provided Danelle in a first step with different versions of a possible tagline. So this is it. This is what I did for Danelle and her lovely graphic design brand Sword & Sparrow. This project was an absolute joy to work on and I am absolutely happy with the final outcome and can't wait to see how Danelle is going to implement her new Brand Strategy into her design and the website that will be launched very soon!